This scene (via Martha Stewart) is one of my favorite holiday images. 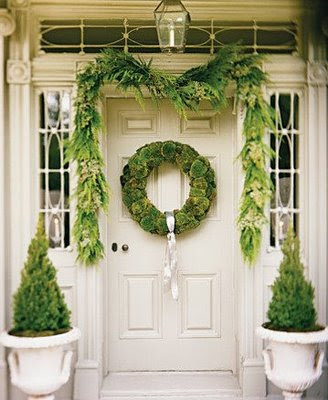 The white and green color palette is my favorite; the architecture of the door, the delicate pattern on the panes of the sidelights, transom windows, and door surround also has great appeal. I just noticed the little candles in the windows, which was one of my favorite holiday traditions growing up. It's a peaceful scene, and on the day before Christmas I appreciate the peacefulness that is a result of a 'to-do' list that is done, and the wonderful anticipation that is in the air. I would like to take this opportunity to wish all of my readers a very Merry Christmas! I truly appreciate each and every one of you, and thank you for your comments and emails. I will be back next week with my traditional year end posts! That is a BEAUTIFUL front entryway. And to use all greens with that creamy white made it perfect! That is a beautiful picture. Have a very Merry Christmas! Merry Christmas! Thank you for including my post. I agree, that is a beautiful entry to a home. The white and simple green colours are perfect together. Wishing you a most Happy Christmas! So happy to have "met" you this year! One of my favorite images too! Merry Christmas!! I love this image too. Merry Christmas and Happy New Year! I love the picture and i too, this year, did decorate the house, lit the trees and for the first time even did a Christmas posts after Midnight mass. it felt wonderful to share the feeling of true Christmas. looking forward to your year end posts. I love the simplistic yet stylish and classy way she decorated for the holidays. The greenery is divine. And thanks for the expeditious delivery of the framed intaglios I recently purchased. They are proudly hanging on the wall in our upstairs hallway. I hope to post a pic on the blog very soon. Thanks so much for all of the wonderful posts over the past year. Blessing to you and your family for a super Christmas and prosperity to all of us in the design fields for the coming year. Thanks so much! And we appreciate you and your aesthetic!! Thanks for your note - I love that photo too!! Hope that you had a very special Christmas Day and that you have enjoyed every special moment of the Holiday Season, Here is to looking forward to a fabulous 2010. Merry Christmas! I love all the gorgeous greenery against the white -- it's so crisp and classic but still fresh. Hope you and your family had a marvelous day! Hope you had a wonderful Christmas. Thanks for your great blog. A class act! Merry Christmas to you! I just posted my favs for 2009 and you are on the list! Check it out! I love that picture...its like the black is the third colour that grounds everything. Martha is still up there in my books! Verkligen en vacker entré, och mycket vackert på din blogg. i look forward to seeing your new home unfold in 2010! I mentioned your blog in my post today!! Wow! I really adore the green in the image too! It's rare to see arrangements that are all green. It looks so natural, crisp and elegant.